Erika Price Handcrafted Artisan Jewellery: Good luck in the Chimney! Good luck in the Chimney! Chimneys which are used regularly need to be swept regularly, so this week we had a visit from R.Fisher & Son, our wonderful chimney sweep. The family are well known in our area and have swept our chimneys for years, but this week I learned something completely new - apparently it's good luck to see the brush sticking out of the chimney pot. I'd never bothered to look before, but it looked so cute I took a photo, and here it is. You never know, it might pass on a bit of good luck to you too! 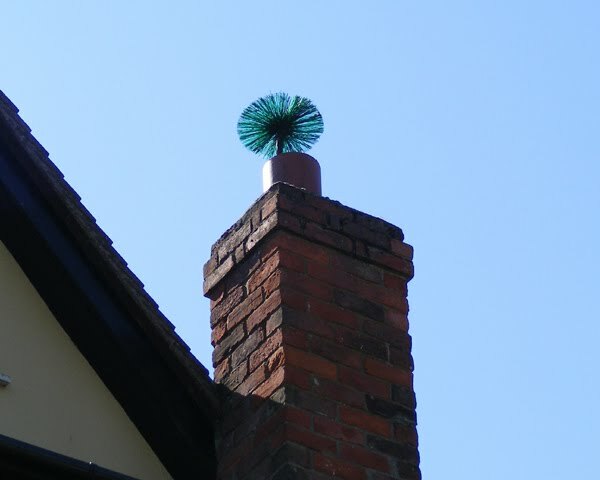 I can't say I knew this info about the brush and the chimney pots before either! (LOL) Nice to see this photo to know it know (times 9 in your case) and thanks for passing along the good luck! wishing you a year of incredible success!